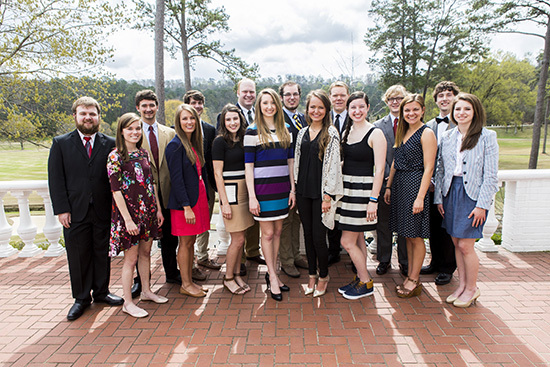 Sixteen Samford University students recently received cash awards from the Birmingham Center of Colonial Dames of America for outstanding papers written in Samford history classes. The papers were submitted in the annual Colonial Dames’ American Independence essay contest. Other top 10 finalists winning $300 each were: Thomas Jenkins, a senior history major from Atlanta, Georgia; Franklin Lowe, a junior history major form Fayetteville, Georgia; and Amber Hammond, a sophomore history major from Atlanta, Georgia. Joshua Lay, a December, 2014, history graduate from Brierfield, Alabama, who now attends New Orleans Baptist Theological Seminary, won a $200 award. Honorable Mention and $50 prizes went to six freshman essay writers: Jack G. Kawell, an engineering physics major from Chicago, Illinois; Hannah Johnston, an international relations major from Travelers Rest, South Carolina; Madeline Ingram, a psychology major from Maryville, Tennessee; Sarah Marriott, a pre-pharmacy major from Atlanta, Georgia; Madeline Perkins, an English/political science major from Tulsa, Oklahoma; and Austin Mohlenbrok, an economics major from Tuscaloosa, Alabama. The awards were presented by Samford history department chair S. Jonathan Bass at a luncheon at Mountain Brook Club on March 26. A collection of the winning papers was dedicated in honor of Meade Whitaker, Jr., and in memory of his mother and grandmother, the late Frances Baldwin Whitaker and the late Fannie Dunn Baldwin, both longtime members of the Alabama Dames. Meade Whitaker is a third-generation supporter of the Samford essay program. A bound volume of the essays will be housed in the Samford library.